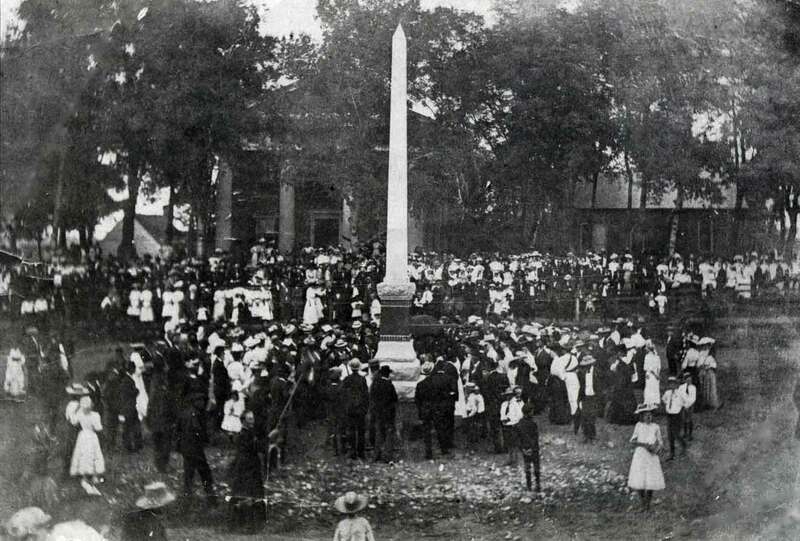 1908: Buckingham County’s Confederate Monument | slate river ramblings . . . . When Charlottesville’s The Daily Progress reported the erection of Buckingham County’s Confederate Monument in 1908, Capt. Irving and the Battle of Rich Mountain were remembered. The Confederate Monument just erected here was unveiled yesterday at the same time the cornerstone was laid. The double ceremony was very impressive, and was attended by a large crowd, including a great number of veterans. Mr. William H. Megginson, an aged veteran, who has been bedridden for many years, was placed in his wheel chair and rolled to the base of the monument, and he pulled the string that threw aside the veil, and displayed to sight the beautiful monument. A great cheer went up from the crowd when the veil was removed. The inscription on the monument reads. Judge Duke’s speech was a gem, and when he referred to Lee as the god-like man he was cheered long and loud. He was introduced by Colonel R. F. Hubard, who also made a neat little speech, in which he mentions the bravery and patriotism of the late Captain Carter Irving, who was captain of the Lee Guard, and who first said he hoped a monument would be erected to the memory of the brave boys of Buckingham, who laid down their lives. One man out of every five of Captain Irving’s company fell at the battle of Rich Mountain. There was a splendid dinner served on the grounds, which the old soldiers seemed to enjoy. A band of young girls dressed in red, white, and blue sang Dixie and a number of the war songs of long ago. Captain Sam P. Moseley was on hand with his banjo and sang. When the day was well-high spent in happy reunion and rejoicing there were calls made for a speech from Hon. R. W. Hubard, who responded briefly. The Battle of Rich Mountain, Part III | slate river ramblings . . . .